With the inner track fence temporarily removed for track work on Track 3 (and next, with the new rail dropped recently, Track 2 ), Cornwells Heights is once again a good photo location. 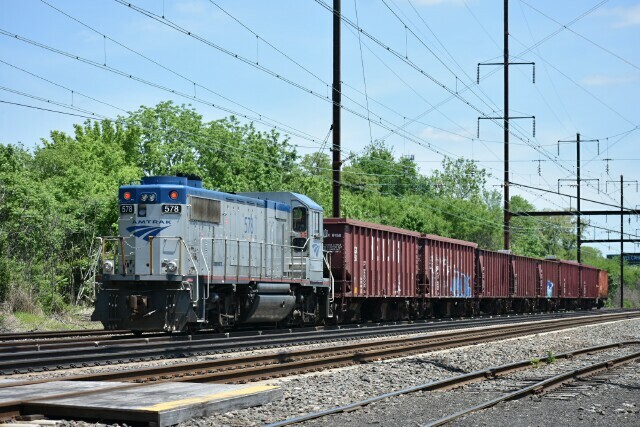 And when you go to the NEC, what you are going to see for the most part are the speedy electrics, but today it is diesel day as Conrail FJ-10 out of Frankford Junction passes the station led by CSX GP40-2 6201. Note the cutout and painted pilot denoting the capability to operate in third rail territory. and the grade on the siding is downhill from the station west. But since FJ-10 frequently leaves cars on the siding, it is better to be safe than sorry. 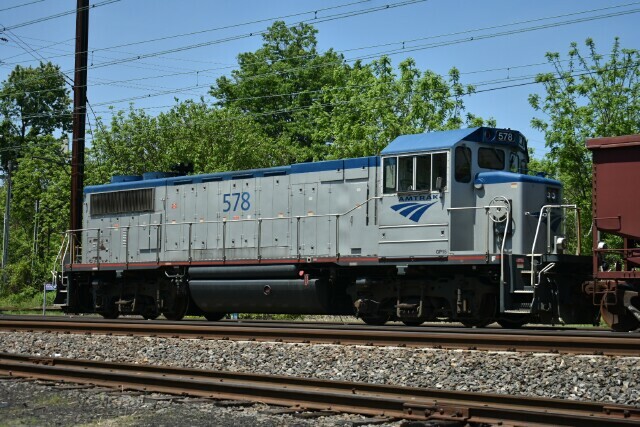 The Amtrak ballast train was parked waiting for a crew, which is an unusual sight on the NEC that allowed for numerous photo opportunities. Like closeups of GP15D AMTK 578. Similar in design to MotivePower Industries MP1500D, it is one of twenty units of this model built. 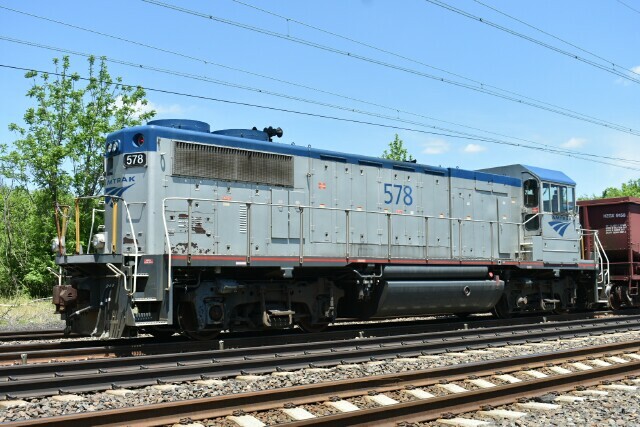 The first ten were built by Electro-Motive Diesel in 2000 for leasing company CIT Group with MPI building another ten for Amtrak in 2004. All of the engines are Caterpillar powered. 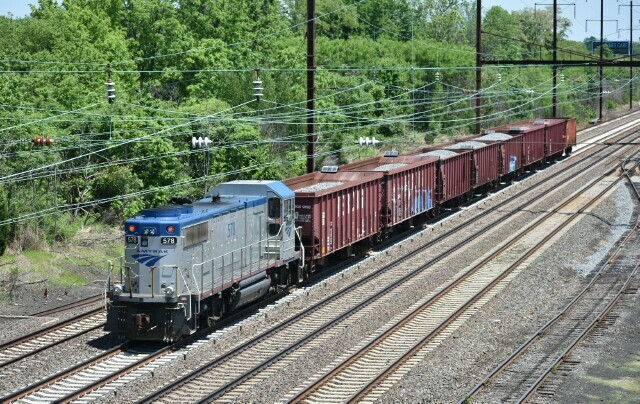 Seven of the eight ballast cars were Herzog's with the last one being an Amtrak hopper. 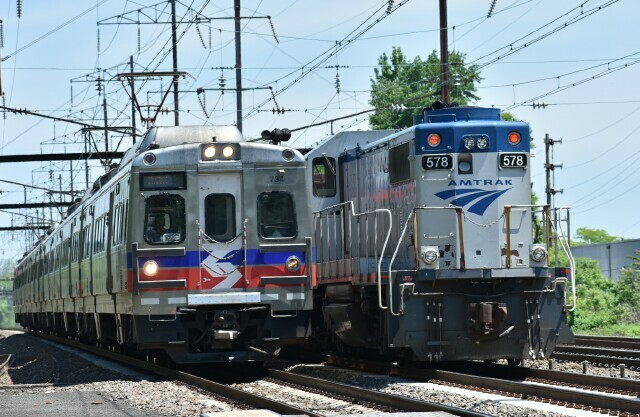 An inbound SEPTA Silverliner V train passing the ballast train. A couple of days later, Track 3 would once again be available from Grundy to Holmes.